Morgan Lucas won drag racing’s biggest prize – the Chevrolet Performance U.S. Nationals – in his sixth race of the 2015 season, defeating rookie candidate Dave Connolly in Top Fuel. 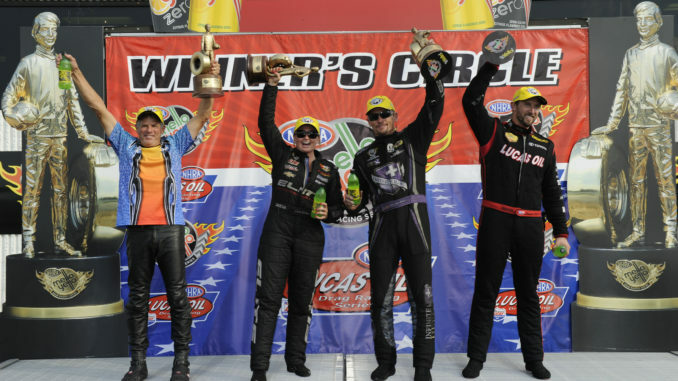 Jack Beckman doubled up, winning the Traxxas Shootout on Sunday and sweeping Monday’s NHRA Nationals. Erica Enders continues her championship stride, beating her biggest competition, Greg Anderson, in Pro Stock and an emotional Jerry Savoie won over teammate Chip Ellis in Pro Stock Motorcycle to conclude NHRA’s regular season at Lucas Oil Raceway at Indianapolis. For the second straight year, all four winners were first-time champions of the U.S. Nationals. Morgan Lucas jumped for joy on the starting line a year ago as his rookie driver, Richie Crampton, won the U.S. Nationals. This year it was his turn to win Indy for his Lucas Oil team. He opened the day by beating Leah Pritchett with the quickest time of the first round which put him against teammate Richie Crampton in round two, getting by him on a holeshot. 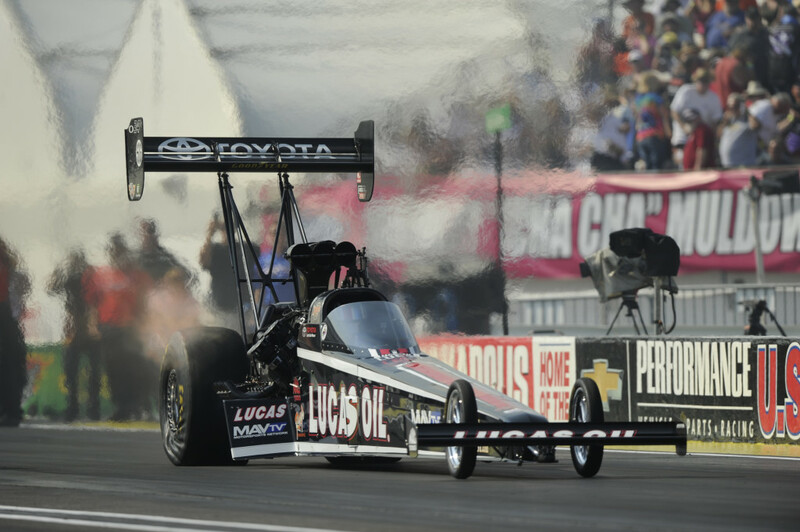 Crampton smoked the tires in the semi-finals, leaving Lucas to pedal his way to the finish and into his first Indy finals, defeating Brittany Force. Against Connolly, Lucas made a terrific pass of 3.864 seconds at 319.60 mph while Connolly slowed to 6.235 seconds at 83.47 mph. Rounding out the weekend in Top Fuel, Antron Brown won the 2015 Traxxas Nitro Shootout for the first time in his Top Fuel career, running a 4.147-second pass at 220.62 mph to defeat Doug Kalitta. 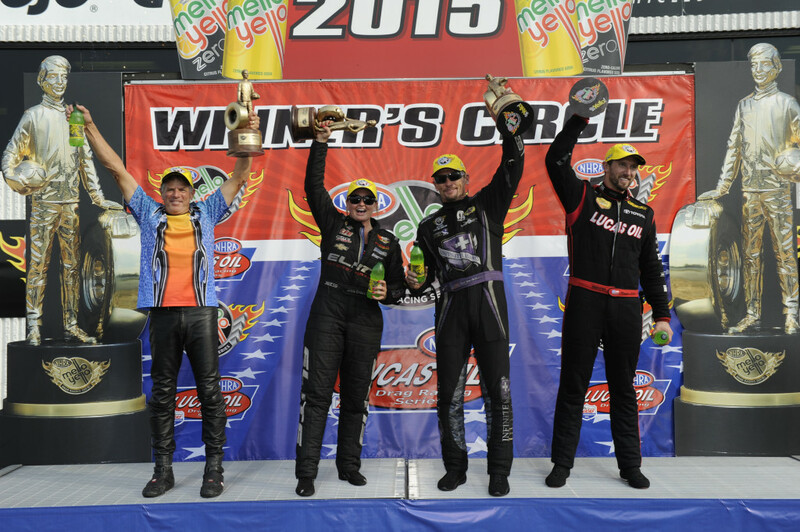 A year ago, Jack Beckman could never have imagined how bright his future would be after missing the 2014 NHRA Countdown to the Championship, but this Labor Day, Beckman drove his Infinite Hero Dodge Funny Car to an impressive victory. The win not only put the Don Schumacher Racing team into the Countdown from the No. 1 position, but crew chief, Jimmy Prock and assistants John Medlen and Chris Cunningham also won Sunday’s Funny Car Traxxas Shootout, adding $100,000 to their bankroll. The dynamic team also set track records for elapsed time at 3.936 seconds at a speed of 323.74 mph en route to winning its fifth pole of the year and four consecutive. It is the sixth NHRA Wally trophy for the Infinite Hero team this year and the first U.S. Nationals title for Beckman, who has won 18 times in his pro career. And he certainly did that in Monday’s championship round against former world champion Robert Hight of John Force Racing. 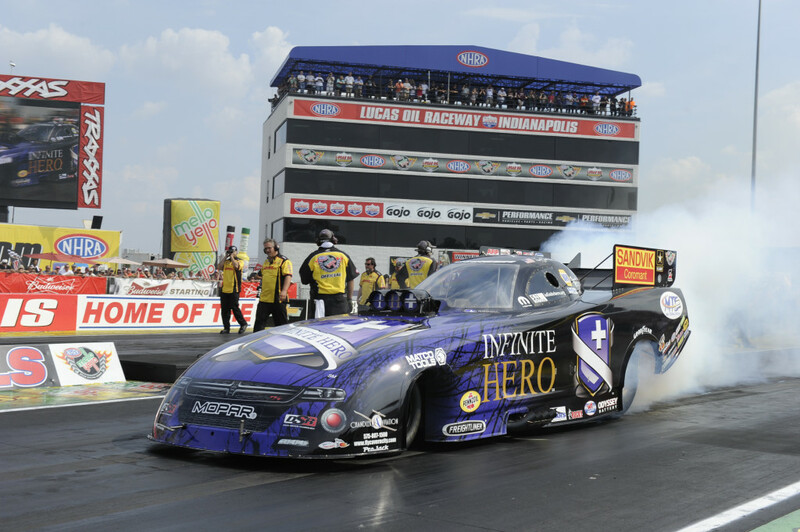 Beckman was a key factor in beating Hight because it was one of the few times this summer that the Infinite Hero Dodge was not the quickest car. Hight’s 4.045-second run was quicker than Beckman’s 4.058 but Beckman’s much better reaction time at the starting line (0.034) enabled his Funny Car to cross the finish line first. The Beckman DSR team finished the regular season with a staggering 178-point margin over teammate Matt Hagan. Beckman will lead Hagan by 30 points once they are reset for the six-race shootout that begins in two weeks near Charlotte. 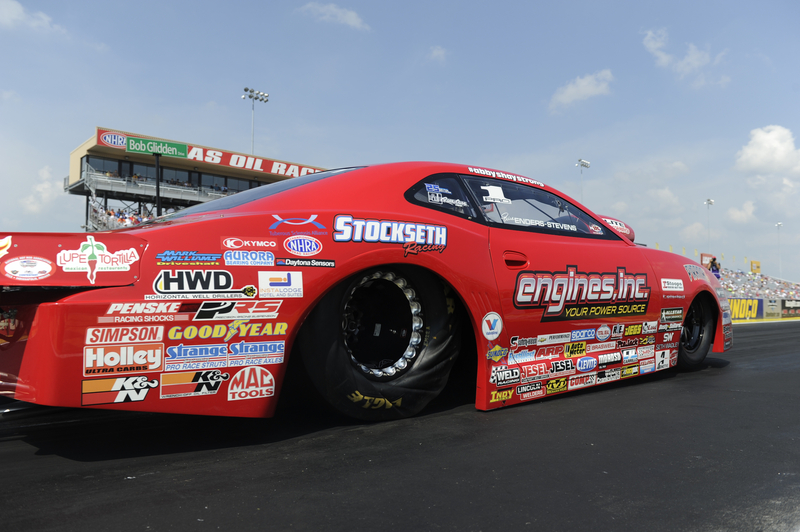 Erica Enders-Stevens can now add U.S. Nationals champion to her growing list of accomplishments in what is becoming a legendary career. Enders-Stevens won the Chevrolet Performance U.S. Nationals at Lucas Oil Raceway with a brilliant driving display, beating her final three opponents on holeshots, including Elite Motorsports teammate Drew Skillman in the final round. Then came a big matchup in the semifinals against Greg Anderson, who was second in the points standings and the No. 1 qualifier at Indy. But Enders-Stevens drilled the Tree (.013 to .054) and overcame Anderson’s 6.591-second pass at 210.41 mph with her 6.618 at 209.39 mph. 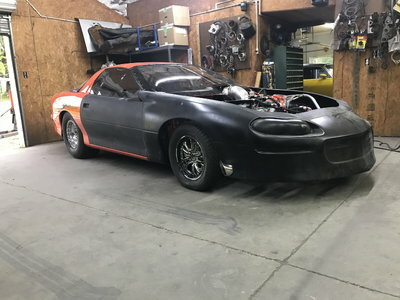 In the final against Skillman, Enders-Stevens had another .013 light to Skillman’s .025, and her run of 6.611 seconds at 209.75 mph was enough to hold off his 6.606-second run at 209.98 mph. The victory was her sixth of 2015, and her career total now matches Shirley Muldowney’s. 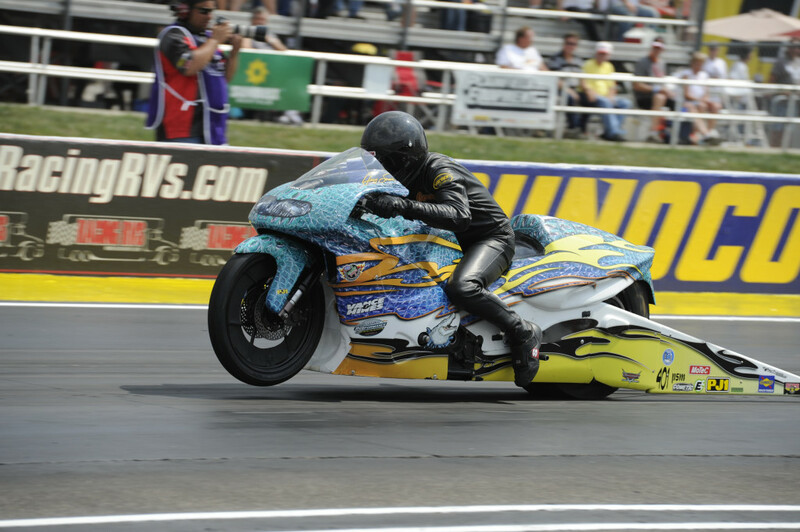 In Pro Stock Motorcycle, Jerry Savoie took home his second victory of the season with a time of 7.011 seconds at 193.02 mph on his Suzuki, beating No. 1 qualifier Chip Ellis who fouled out at the start on his Buell. The win was Savoie’s third career victory and his first at Indianapolis. He was the runner-up here in 2011 and 2014. He defeated Chaz Kennedy, Steve Johnson and Hector Arana Jr. to advance to the final. Ellis was the No. 1 qualifier and was looking for his first win of the season. Despite the loss, Ellis was able to move around LE Tonglet and earn a Countdown spot. Scotty Pollacheck secured the final Countdown spot when three-time world champ Angelle Sampey lost in the semifinals. The Mello Yello Countdown to the Championship, NHRA’s six-race playoffs, will begin in two weeks with the NHRA Carolina Nationals, Sept. 18-20, at zMAX Dragway in Charlotte, N.C. The championship is open to the top 10 in each professional category following the U.S. Nationals and ends at the Auto Club NHRA Finals at Pomona, Ca.